If you follow my Instagram, you will remember I was stoked about getting some hard to find applique pins from Japan. Um. yes. They do MATTER that much. I felt like I had hit the lottery when I tracked these babies down. For fine intricately layered applique, small, sharp and strong fine shaft pins are ESSENTIAL! Not the pins that are weak and bendy (bug collecting style), or the dull pointed ones, but pins that stay firm through layer(s) of fabric. I have been using Clover’s applique pins for awhile now. You know the ones with the white teardrop head and short? They have been the best to use because they are the sharpest available on the market. For the most part, they slide through the fabrics fairly well without major resistance. They also do not bend with the slightest of gentle force. Resistance from pins causes carefully placed pieces to shift out of alignment when pinning. It is essential they be sharp and not wilt with pressure. They have a green glass head and the thin shaft is, as Goldilocks said, “just right“. 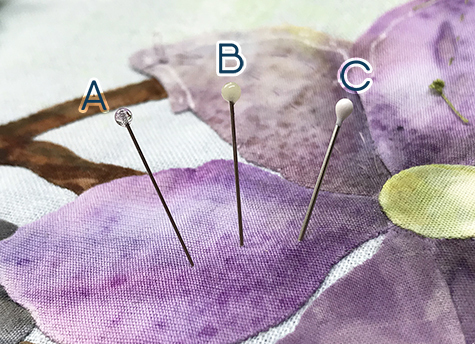 The shaft width measurement is in between the Clover pins (C) and the Little House “new” pink headed applique pins (A) in the picture just below. They are very thin but do not give way if I have to employ a bit of force to get the pin through some thicker layers in a tight area. The new Little House pink headed applique pin is the thinnest of the three but fairly strong. The only reason they *slightly* fall short of the green ones, in my opinion, is because they slightly yield on the thicker pin jobs. 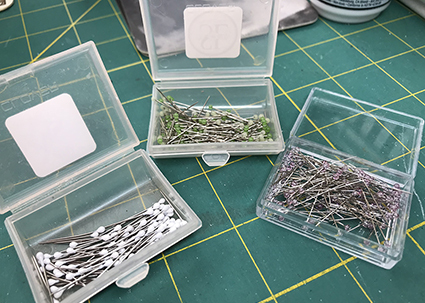 Little House is discontinuing production of the green headed pins to be replaced by the new pink headed pins. Which is probably why they are so hard to find. The Clover (white head) has been the gold standard for a long time but as you can see in the shaft comparison between them and the two Little House pin products, the Clovers are much thicker. 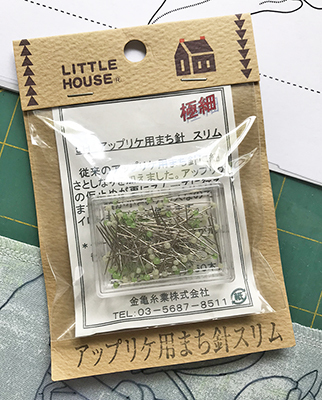 Now the great thing is you no longer have to decipher a Japanese market ordering site in order to get the Little House Pins! At spring Quilt Market I was searching for a wholesale supplier so I could offer these in workshops and online in my shop. There is no need for me to do that anymore because you can easily order them retail from the importer’s Etsy shop and the business is in California. YAY! Shipping is quick and the Etsy shop is Kimonomomo. There are also some of the green headed pins left in stock. 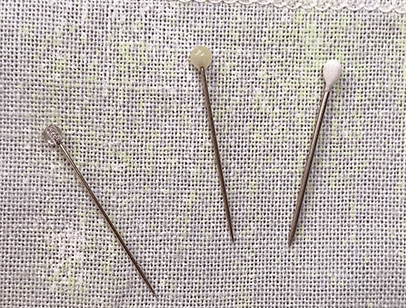 If you like the longer sewing pins from Little House, the site has them listed too. Having the right tools really does make a difference between “it will do-meh” and “Wow! so much better!” when it comes to hand applique. We spend $$$ on a sewing machine(s), so spending $8 and some change on pins is a drop in the bucket in comparison. 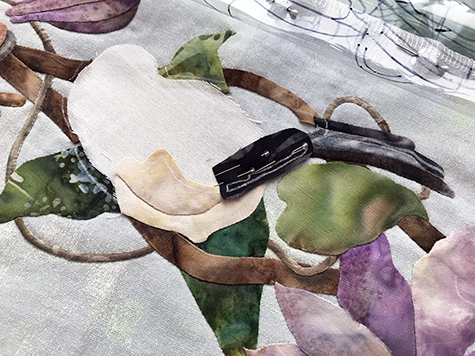 I say, “they are priceless” for making the applique process a much more pleasant one. Treat yourself, you deserve it. The number one reason hand applique gets a bad rap. If you understand the handling of seam allowance, then a chorus of angels appear and the heavens open up to unlimited possibilities. OK, well maybe not, but you will be able to rid yourself of a huge amount of applique angst. Maybe enjoy the difficult stuff? maybe? Again we have to applique a piece that looks to be impossibly small and surely too small to be able to hand applique. Not if you know what to do and how to deal with the seam allowance. You might want to save this by printing it out for the future. There is a small strip of black that needs to go under the wing pieces. I think in the narrowest area, it is less than a 1/16th” wide. As in the last blog post, I will guide you through it. When you cut out your piece, increase the seam allowance to at least 1/2″ wide. Position in place and pin firmly. One pin will not cut it folks. You need to pin piece(s) WELL. This creates the needed tension for stitching, keeps the edges from flopping wildly while resisting turning and keeps the piece right where it should stay and not “walk”. With this particular piece, you are only stitching a straight edge seam on one side. 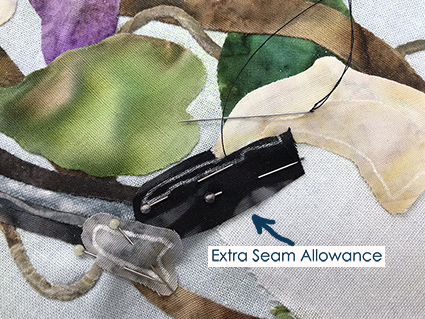 Because there is so much extra fabric added to the opposite seam allowance, you are not struggling with an impossibly small piece that is difficult to keep in place and stitch. 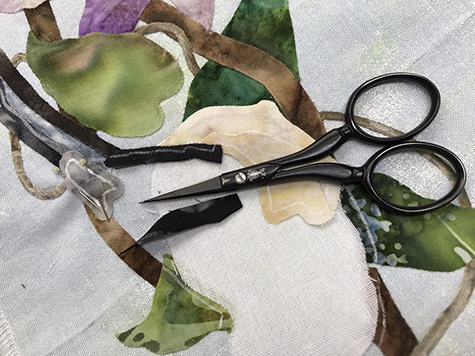 I can also tell you that glue and starch will not work with a piece like this–too much seam allowance too stuff in a small difficult area and the disadvantage of not being able to reduce the bulk so it lies flat. Once stitching is completed. Trim away that excess seam allowance. Now you are ready to move on and no ‘drink’ was needed to recover. I am taking a break from teaching starting in 2020 to work on my own projects. The last workshops scheduled are in 2019 and on the right side of this page. If you are reading this on a mobile device then you will need to scroll down to see the schedule. I will still have my blog, website, and Instagram as usual. I am an Author, Designer, Illustrator and a major international award winning quilt artisan. I love working with fabrics and threads and they have become my medium of choice. Thank you for the lesson and advice about the pins. I immediately ordered both the green and pink- just to be on the safe side. It’s absolutely understandable that you’re reining in your teaching schedule but I must say that it makes me the tiniest bit sad to know that I couldn’t have gone to one. You know how grateful I am that you’ve been so generous here for so many years. Thank you, again, for sharing.